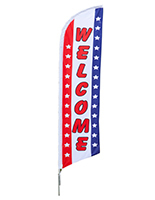 These welcome banners are ideal for attracting new customers to your business. 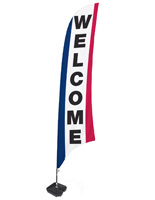 The large flags come with an anchor base that can be filled with water for durability in outdoor settings. Each of the polyester banners are weather resistant and full color for maximum attention. The 13' pole can be placed easily in the base and stands tall enough to be seen from a distance. These banners are not designed for use in 20+ mph winds so be weary if your area becomes windy. 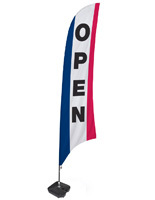 Order your feather flag to attract new business to your retail or commercial setting today!